U.S. Stock Market Looking Up? The U.S. stock market had its best start for the year in more than a decade. In the last 3 months, the Dow Jones Industrial Average shot up 6.4%. This may be a sign that the U.S. economy is finally on an upswing, after the Great Recession. In spite of major world events such as the Arab crisis and the Japan earthquake and nuclear leaks, the U.S. stock market has shown resilience. Let us use this opportunity to understand what the stock market is about, and how it's been doing recently. What are stocks? What is the stock market? A stock is a share of ownership in a company. Imagine dividing the ownership of a company (say, Acme Company) into a million pieces. If you own one share of Acme, you actually own one-millionth of the company! When the company makes profits in a year, the company may decide to give you a small share of the profits (this is called dividend). The company has a limited number of shares out, so someone who also wants to own a part of Acme has to buy shares from a shareholder like you. For that, he may have to pay more than you did for those shares, so you make a tidy profit! On the other hand, if Acme starts doing very badly, you may panic and decide to sell your shares at a much lower price than you bought it at. All of this buying and selling happens in the stock market exchange. Examples of exchanges are New York Stock Exchange (NYSE) in Wall Street, New York, and the London stock exchange. Earlier, stocks were traded by hand (and lots of shouting) on the floor of the stock market exchange. Of course, these days, most trading happens through computers (online trading). The stock of a company can be very volatile - it goes up and down depending on news about how the company is doing. Each stock has an abbreviated ticker symbol. See this chart of Apple Computer (AAPL) - its stock has gone from $230 to $350 in the last year, but notice the ups and downs - whenever Apple announced great earnings, AAPL stock went up. But when Steve Jobs, the CEO, announced that he had cancer, or when there were reported problems with the iPhone 4, the stock went down! Stocks also go up and down due to the overall economy. When the recession hit, stocks came down by 40% on an average over the next six months. 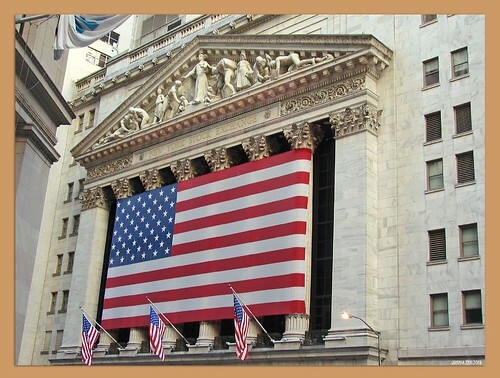 Political events such as the Arab crisis, or even U.S. Presidential elections cause changes in stock prices. Everyone should be saving some part of the money they earn on their jobs - perhaps even you can save some money earned through summer jobs or allowances. This money can be kept safely in banks, but your money does not grow very much there, as the interest rate is very low these days. If you invest in stocks, your money can grow much more. However, you have to do your research to find out which are the best companies to buy stock in, and when to buy them. If you invest in the wrong company, or buy stocks when they are at their peak price, you may end up losing your original capital. Many people find it safer to invest in index mutual funds - these are like stocks, except that they represent many companies, rather than just one. For example, the S&P index fund represents the top 500 U.S. companies. The Dow Jones Industrial Average represents 30 large U.S. companies. If you find all this $$$ stuff fascinating, and are good with numbers, perhaps a career on Wall Street is in your future? This is a difficult topic.. please ask questions, and we'd be happy to answer!